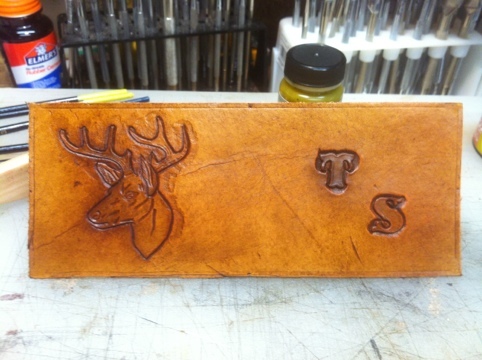 My son took an order for a hand tooled wallet for a coworker. He called and asked me to pick him up a kit from the hobby store, which I couldn’t do: they were out of stock. So, he asks if I can make him a kit from scratch, which I could, and agreed to do. Then a few hours later he calls and says he has to work a double shift and needs the wallet by 6:30 tomorrow morning; can I make the whole thing? I agreed even though I probably shouldn’t have; the design was to include a figure carving of a deer head, which I’d never done before (any animal figure carvings for that matter) and really don’t have the “right” tools to do it. A few hours later and I ended up with a pretty decent project. And having learned a few things to boot! 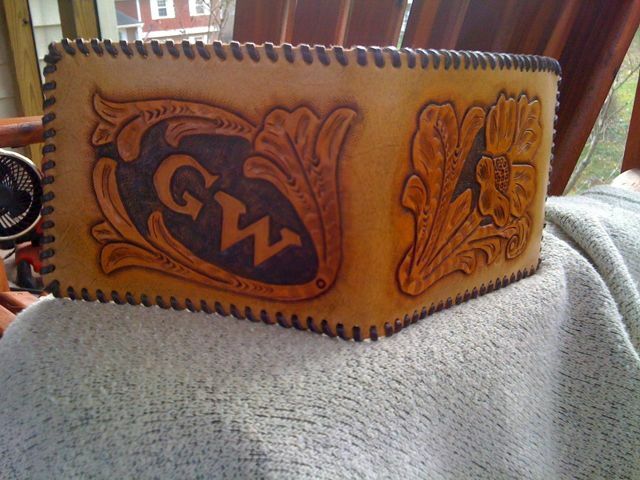 The entire “kit” was hand cut and after carving and finishing it was hand sewn and laced. I used Tandy Leather products for most of the finish along with a few other items to get this nice rustic look. SuperSheen was my resist, EcoFlo briar brown highlight was next, followed by two spray coats of Krylon clear acrylic satin. I then used my secret weapon: Kiwi shoe polish in brown. This takes the edge off the excessive (in my opinion) shine and warms it very naturally, along with giving a bit more highlight. I know the deer isn’t perfect but not bad for a first try. And one that was not planned for or had the correct tools to do. The interior came out nicely I think. I sewed the top edge instead of lacing it as I usually do. This greatly reduced the bulk and make it much sleeker. I painted the top edge with my own recipe of edge dressing: one part acrylic paint (black here) mix with one part SuperSheen. The lace is goatskin. I like its strength and performance. And I think it’s a great value for my money. It’s a combination of single (on the thinner edge) and double loop lacing. I also found a new-to-me way of ending my lacing. And I’m extremely happy with the new way and how it looks. It’s detailed in one of the teaching manuals I got from TLF, though I can’t recall the title at the moment. So, he’s happy, I learned a thing or two and I got forced into relaxing for a few hours at my favorite hobby. 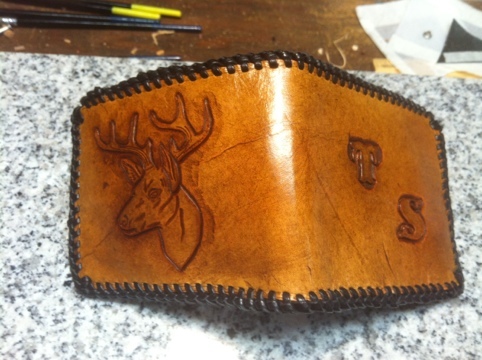 Oh, and someone is getting a nice hand crafted wallet for Christmas. I guess this one is a win-win-win. This rose is a Peter Main design. I got the pattern from my guild’s library: the IILG. I carved it and then colored it using water color crayons, by dipping a shader brush into water, rubbing the brush on the crayon and then painting onto the leather. I then went back and did a little shading and blending. This is a technique I learned from another guild member. After the coloring was done I finished it with a couple of coats of Kiwi neutral shoe polish. The rose is a birthday gift for a little girl we goto church with; her name is Madison, thus the rose’s name. 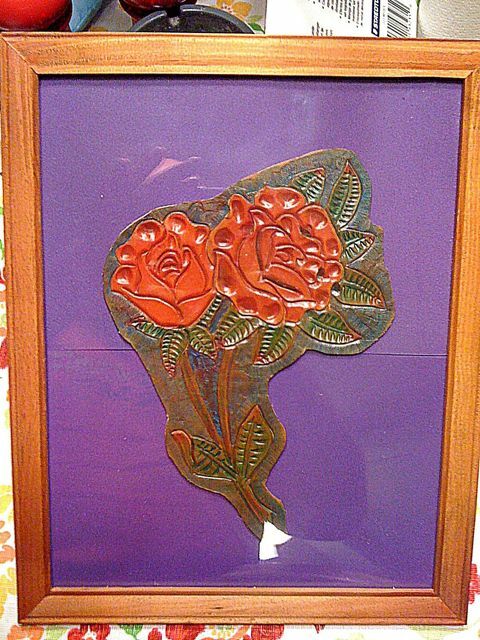 Her favorite color is purple; that’s why I chose the purple background, which is craft foam sheets to raise the leather carving a bit for more depth. I completed my wallet today. Last night, over several hours, I put the finish on it. And I laced it today, using a whip stitch. I resisted it first then applied some antique gel. After that was “set” I applied some highlighter to only the carved and tooled area. Both were saddle tan. I then used some brown leather dye to darken the backgrounded areas. For the final protective finish I used neutral shoe polish. Since all of my other products were water based, I find that the wax is the safest top coat. It does have to be reapplied every so often though, maybe every other month, depending on wear and usage. This is the first item I’ve made for myself, other than a key fob. I am using a kit to make it, rather than cutting the pieces from a pattern as I like to do. The reason for this is that I don’t have any nice thin leather on hand. The kit doesn’t align as it should, a common problem with kits. So I’ll need to trim and punch some new holes to assemble it. 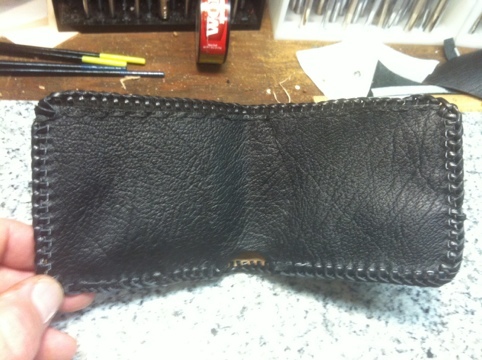 At this point the outside of the wallet is carved and tooled. It has also been conditioned with neetsfoot oil. It needs to be stained or antiqued still; I’ve not decided for sure how I’m going to finish it. After I do that it will need sealed. More information and photos to come as the project proceeds.